The public sector airlines’ Air-India and Indian Airlines are looking at expanding their operations and preparing to face competition from the private airlines, as the Indian skies are being slowly opened up. The government in a bid to provide the best to travellers has identified the international airports at Delhi, Mumbai, Kolkata and Chennai to accommodate the newly-unveiled 555 seater A-380 aircraft. The Centre today said it was looking at any violation of law in the allocation of one crore Reliance Infocomm shares to three unlisted firms at the rate of Re 1 each. The Opposition today accused the Finance Minister of cheating the people through his Budget with the “ jugglery of statistics” and alleged that more taxes have been imposed on all sections of society. 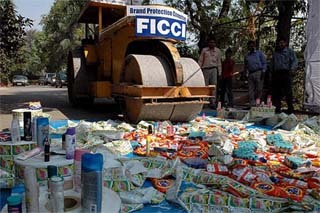 A bulldozer destroys a pile of counterfeit products on World Consumer Rights Day in New Delhi on Tuesday. The Ludhiana Stock Exchange (LSE) is awaiting Sebi clearance for demutualisation. The stock exchange has already sent required documents to the Securities and Exchange Board of India (Sebi) for approval. Demutualisation of the exchange would separate ownership from management and trading. The country’s largest carmaker Maruti Udyog is planning an across-the-board increase in car prices from April 1 on the back of hike in steel prices following this year’s Budget proposals. Public sector telecom behemoth Bharat Sanchar Nigam Ltd. (BSNL) has endorsed the proposal for unification of MTNL with BSNL, arguing that if the government executes the move, ‘it will establish a synergy’. Trade ministers and representatives of 20 developing countries (G-20) will meet in Delhi to draft a key a position paper highlighting the critical areas of concerns, particularly those pertaining the farm sector and rural economy. Sonnen Insurance Broking Services Private Ltd, a non-life insurance broking firm, has launched its operations aimed to design tailor-made insurance cover for domestic clients. Company CEO Rothin Guha told reporters at the launch here that unlike the insurance agent who represents only the insurance company, the company will be representing the buyers and assist them in filing claims as well. SmithKline Pharmaceuticals Ltd is to buyback shares at a price up to Rs 800 per share with an aggregate ceiling of Rs 230.65 crore, helping to raise promoters’ holding and improve shareholder value. Since Delhi and Mumbai airports have already been short-listed for the first phase of modernisation of Indian airports to international level, the Airports Authority of India (AAI) has also identified airports at the other two metro cities to be fit enough to accommodate ‘super jumbos’ which were unveiled earlier last month. According to Civil Aviation Minister Praful Patel, three parking bays have been identified at the Mumbai Airport, two at Delhi Airport and one parking bay at the Chennai Airport to handle A-380 type of aircrafts. However, he said that the work of identifying the parking bay at Kolkata airport was at the preliminary stage. Besides the four metros, the proposed new greenfield international airports at Bangalore and Hyderabad would also have the facilities for handling A-380 aircraft. Since they would still take time to develop, the focus at present is on the four airports. Meanwhile, studies have already been carried out for adequacy of runway length, taxiway width, turning radii and apron parking positions at the Hyderabad and Bangalore airports. The first of the super jumbos is scheduled to be delivered to Singapore Airlines next year when AAI is also looking at providing facilities to accommodate these aircrafts at the four metro airports. On the other hand as the government looks at improving the air travel facilities in the country, the public sector airline Air-India is looking at becoming a part of the 15-member strong global airline alliance, Star Alliance. Till recently, the country’s only flag carrier, Air-India, is weighing this option to expand its network and offer greater options to passengers. Reports suggested that with more competition there is a sense of urgency in Air-India to be part of an airline alliance and officials said that joining the Star Alliance would provide the best possible synergies to Air-India. Air-India recently also entered into a strategic alliance with a leading member of the Alliance, the German airline Lufthansa to expand its services. The possible entry into the Star Alliance could provide A-I with access to 772 airports in 133 countries. Besides, A-I passengers will not only have access to 575 airport lounges but also the possibility of earning and redeeming frequent flyers miles or points on any member airline. The Centre today said it was looking at any violation of law in the allocation of one crore Reliance Infocomm shares to three unlisted firms at the rate of Re 1 each. Finance Minister P. Chidambaram told the Rajya Sabha during question hour that Reliance Infocomm was an unlisted company which did not fall under the jurisdiction of Sebiand its regulations. “The directors and general body of an unlisted company are, under the law as it stands today, free to allocate shares to anyone as long as appropriate resolutions are passed,” he said. Replying to supplementaries raised by Mr Jibon Roy (CPM), the Finance Minister said the government was looking into the matter to see if there is any law violated. “At the moment, I am not in a position to say that any law has been violated,” he said. To a question about the alleged violation of Trai prescribed standards of technology by Reliance Infocomm and the subsequent heavy loss to the exchequer “under pressure of a former Communication Minister,” Mr Chidambram said the question should be put to the Communication Minister. Mr Sanjay Nirupam, who resigned from Shiv Sena and announced plans to quit the Rajya Sabha, also raised the issue of sale of Reliance shares to “fake” firms in the House. Mr Nirupam had earlier said that he would delay his resignation from the Upper House till he raised the question on the allotment of Reliance Infocomm shares to alleged fake companies. Mr Chidambram said unlisted companies did not come under Sebi jurisdiction. He said there were some complaints relating to Reliance Industries Limited, which is a listed company. Now, sitting at Chandigarh you could keep a watch on your facilities at Ludhiana, Jalandhar, Delhi, Mumbai and Chennai. And the police and other security agencies can step up vigilance with the help of the newly launched Reliance Infocomm’s City Video Surveillance System. The company will install the cameras at the locations required by the customer, which would be connected to a monitor installed at the distant desired location, through its state-of-the-art Optical Fibre Network (OFN). The cameras are capable of being controlled, zoom, pan or tilt from a remote location. The screens are also capable of showing multiple locations at the same time. The company has recently undertaken a pilot project at the behest of the Delhi Police to set up a City Video Surveillance System (CVSS) for itsTraffic Wing. Using long-range Pan-Tilt-Zoom CCTV cameras located at vantage locations in Delhi, RIC has provided high bandwidth OFC connectivity that shall enable senior Delhi Police officials to monitor these from multiple locations. This will provide capability for smoother traffic management as well as enhance security in the central Delhi areas. Talking to TNS from Mumbai, Dr Vinod Budhiraja, Head Corporate Sales, Reliance Infocomm, informed, “We are prepared to replicate the facility to other cities. The service will not only find application for the police and other security agencies, but also corporates. It can be used for remote surveillance of offices, factories, malls and shopping centres, restaurants, residences, parking areas and play schools and banks for the surveillance of their ATMs. The police can use it to keep a tab on unmanned crossings”. He added, “We are in advanced stages of talks with a garment manufacturer in Ludhiana who wants us to install the facility at various locations in his factory and at multiple offices spread across the country. We have also been approached by various department store chains in Delhi and Gurgaon”. About the price of the mechanism, Dr Buddhiraja said, “the price would depend on the requirement of the client, the kind of equipment he opts for and the bandwidth he chooses. The cost of one camera is Rs 2-5 lakh. Bandwidth costs are linked to the number of locations the data needs to travel. Sources in the industry maintain that Airtel and Hutch would also launch a similar facility in the near future. Reliance has vast experience in designing and implementing the electronic Security Automation Systems for its internal use. Thousands of cameras across various Reliance’s countrywide locations are managed and controlled from a central Security National Operating Centre (NOC) at Dhirubhai Ambani Knowledge City with video being carried over the RIC pan-India terabit-bandwidth network. Reliance has earlier implemented a world-class security system for its Jamnagar Refinery complex where full-resolution full-frame-rate DVD quality digital video surveillance was used for the first time in the world. He claimed that senior citizens had been given exemption from payment of income tax up to the income of Rs 1.5 lakh. It actually amounted to a concession of only Rs 5,000 in tax as a senior citizen had been put to a loss of Rs 15000, which he would have to pay from his pocket at the rate of 10 per cent. “The women do not stand to benefit much through income tax exemption up to an income of Rs 1.25 lakh,” he said. According to Mr Malhotra, government servants also, instead of gaining by doing away with standard deduction of Rs 30,000 and interest on Rs 12,000, had been put to a loss of Rs 1200 on Rs 42,000. He wondered how the General Budget was in favour of the common man, when the government had imposed cess of 50 paise on the diesel and petrol besides increasing excise duty on steel and extending the service tax net to 12 more items from the previous 80 items. This would make every thing costlier in the market. Describing the Budget as “anti-farmer”, Mr Malhotra said instead of ensuring remunerative price to farmers, the government was just talking of increasing the credit limit. The farmers, he alleged, were getting ruined and were getting only empty assurances. Lambasting the government for its Employment Guarantee Scheme, the BJP spokesman said the scheme had been converted into Rural Employment Guarantee Act to provide only 100 days of employment to every household in rural areas and wondered what would happen to the unemployed in urban areas. He alleged the budgetary provisions for education and health sectors were much below the claims. He demanded setting up of a sixth pay commission for the government employees as the last pay commission report was implemented way back in 1996. Mr Jyotiraditya Scindia (Congress) described the Budget as a reflection of the people’s mandate, adding that it was a march towards ‘Bharat Nirman’ from the “illusory feel-good” of the previous NDA government. Mr Rupchand Pal of the CPI(M) called upon the Finance Minister for special concessions to be extended to the sick jute industry as was given to the sugar sector. ”Tax evasion is rampant in the country,” the CPM member said, adding that the withdrawal tax imposed by the Finance Minister was no solution to it. Supporting the Budget, he said the Left was not against the economic reforms as long as it was aimed at reaching the fruits of development to those deserving, he added. Sebi had, reportedly, asked regional stock exchanges to demutualise by March 31 this year. LSE officials say board approval is likely to be received soon after which the stock exchange would demutualise, which means that brokers would offload shares to the extent of 51 per cent within a year, that is, by March 31, 2006. He said by effecting demutualisation , Sebi aims to bring professionalism in the functioning of stock exchanges. The idea is to shift majority ownership in hands of investors whereas trading remains the domain of brokers and professional experts take care of managing the functioning. Separation of ownership from management would make brokers more accountable to the management, which would also provide a better professional environment to investors. Besides, demutualisation would give stock exchanges freedom to take decisions on diversification and revenue generation. Meanwhile, LSE officials informed that the stock exchange is about to complete the target 120 awareness workshops for investors. The stock exchange, in association with Sebi, conducted these awareness workshops in Punjab, Himachal Pradesh, J&K and adjoining areas of Rajasthan. According to company sources, the proposed raise would be in addition to new pricing announced by the company for switching its cars to Euro III emission norms in 11 cities and to Euro II in other parts of the country as per the new auto fuel policy. After the Budget, there has been a sharp increase in steel prices and the company needs to cover additional costs through higher prices, sources said, adding the quantum of increase would be decided soon. Mahindra & Mahindra, today announced plans to launch the Scorpio in Oman through Towell Auto Centre. A huge success in India, the Scorpio is quite popular in South Africa, Europe, UAE, Qatar, Kuwait, Uruguay and where it was launched recently. “The West Asia SUV market is one of the most dynamic and demanding in the world and we look forward to the challenges it presents,” M&M Executive Director and President (Automotive Sector) Alan Durante said. Scorpio fitted with a diesel engine would also be available for the first time in Oman, he said. Budget expectations and the subsequent fall in purchases resulted in a 4.23 per cent drop in passenger car sales during February, 2005, even as the motor cycles segment continued its northward movement on the back of improved performances by Bajaj Auto and Hero Honda. Addressing captains of the industry under the aegis of the Associated Chambers of Commerce and Industry of India (Assocham), the Chairman of BSNL, Mr A K Sinha, said a report of the committee that looked into the possible merger of MTNL with BSNL has been submitted to the government, a copy of which has also come to BSNL. The BSNL management is weighing the pros and cons of the report, said Mr Sinha adding that BSNL favours a proposal for making MTNL as its subsidiary. Mr Sinha, however, said that the final decision to this effect would have to be taken by the government. The BSNL Chairman announced that his company has set aside an allocation of Rs150 crore for setting up digital satellite phone terminals (DSPT) in 14,000 villages all over the country by December 2006. It has got a mandate for the job from the Department of Telecommunications. Each terminal would be put up at a cost of about Rs1 lakh for which a part of funding will be provided to BSNL from the USO Fund. On the issue of reduction in the STD and ISD rates, Mr Sinha said whenever a need is felt in this connection, a decision will be taken in this regard. The President of Integrated Network Solutions, Lucent Technologies Inc., USA, Ms Janet Davidson, in her presentation said India offered high potential for connectivity in both rural and urban areas. According to her, estimated addressable market today stands between 140 million and 200 million for which the telecom companies are in competition to capture the large chunk of the Indian rural market. 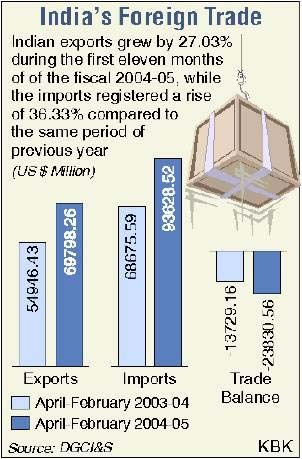 India will be hosting for the first time a WTO event. G-20 is powerful lobby comprising of Brazil, Argentina, China and India among others. The two-day ministerial meeting of G-20 will be held from March 18. The ministerial meeting will be preceded by a meeting of senior trade officials of G-20. Commerce and Industry Minister Kamal Nath today said that G-20 will work towards a definite paper so that group of nations can approach the next ministerial meeting in Hong Kong later this year well-prepared. ”We will try to arrive at a G-20 position paper that will set the tone for the multilateral trade talks,” the minister said, adding the paper would also seek to recommend the milestones to be achieved in the next four months. ”Fourteen ministers have so far confirmed their participation at the G-20 meeting here. Besides, 127 delegates, vice ministers and ambassadors are also attending this important meeting,” he said. The ministers are also having an interaction with Prime Minister Manmohan Singh on Friday. As an insurance professional representing the buyer, Sonnen’s job would be to assess the buyer’s insurance needs based on a thorough understanding of the client’s business, he said. Sonnen has been authorised to act as a non-life insurance broker by the IRDA, the insurance regulator. The company would not be charging any fee from customers, as costs would be covered by the insurance companies by way of brokerage. The company hopes to bring a premium of about Rs 200 million ($ 4.5 million) to Rs 250 million in the first year of operation by targetting small to medium corporate firms. GlaxoSmithKline Pharmaceuticals Ltd is to buyback shares at a price up to Rs 800 per share with an aggregate ceiling of Rs 230.65 crore, helping to raise promoters’ holding and improve shareholder value. The board has approved buyback of its equity shares worth up to Rs 230.65 crore, about 25 per cent of the total paid-up equity share capital and free reserves, the company said in a press note here today. The company would seek shareholders’ consent for the proposed buyback through postal ballot, it said. The equity shares would be bought from the shareholders through the stock exchange route, at a price not exceeding Rs 800 per share, the press note said. GlaxoSmithkline Managing Director S. Kalyanasundaram said the company has seen a substantial cash generation and a favourable liquidity position due to the significant improvement in the operating performance since 2001 and sale of properties. The buyback of shares would enhance earnings and improve shareholder value, he said.